I’m trying desperately not to fall off the wagon again by posting two weeks in a row. (I know it’s been something like 10 days since my last post but I haven’t hit the two week mark yet, so it counts.) Really though, I don’t want to fall off the blog wagon. I want to post every day. Or at least every time I run. Unfortunately, there’s about a million other things I want to do, too and also some things I have to do, and there’s only so much time in the day. Yes, I don’t have enough to do, so I started a new knitting project! I’m calling these my Hermione legwarmers. 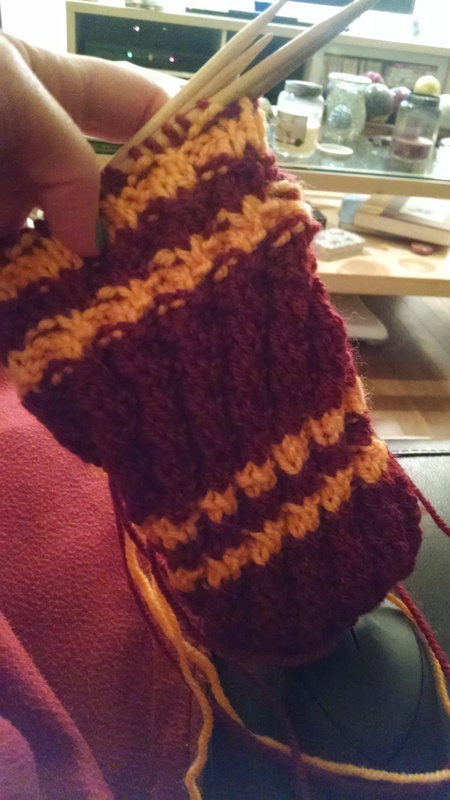 Because they are legwarmers, and I’m using some left over yarn in Gryffindor colors from a scarf I knit a few years back. Well, week 1 and week 2, but let’s focus on week 2. The red ones are what I’m going to call the “unauthorized rest days”. I’ll start with those. On Wednesday, I didn’t feel like going back out after driving home from work. I felt like being lazy. I baked banana bread instead of going to the gym. It was fun and delicious, and you should check out the recipe. 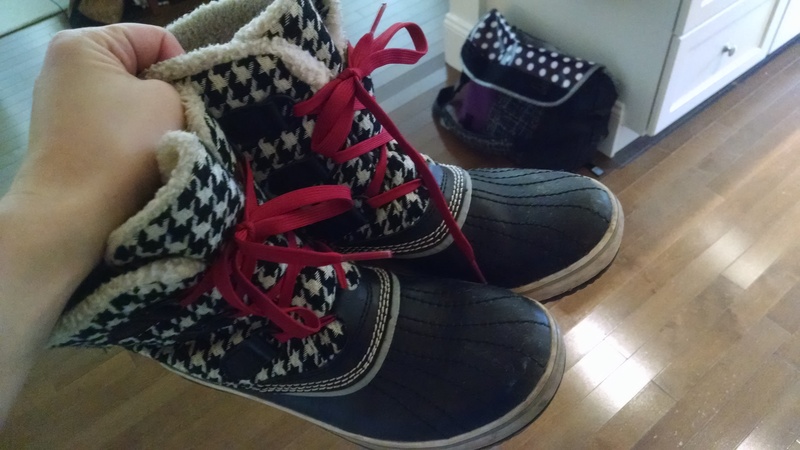 Unfortunately, the next day I found out that my shins do not like when I run in winter boots. They actually kind of hate it, and were quite painful Friday through Sunday. It took until Tuesday for them to be completely better. Lesson Learned! Fancy running boots: good at being boots, bad at being running shoes. Anyways, I should probably mention the actual running I did this week. I did a Foundation Run on Monday and Saturday, Speed Play on Tuesday, and a Fast Finish run on Sunday. They were all fun, and I love running and can’t seem to get enough. I think this has something to do with the fact that with this particular training cycle I am running for MUCH shorter periods of time, so I’m always left wanting more. This sounds like it could be frustrating (and sometimes, it is a little), but I think it’s really helping to keep my excitement levels high. Now, I know you don’t know exactly what I’m talking about with my different types of runs (although some are easy to guess), so as I write up these recap posts, I’ll try and give a little bit of detail about each type. This week, I’ll talk about Foundation Runs because those are the most prevalent types of runs in my schedule. Effort level for Foundation runs ranges from extremely easy to comfortable. You start out at extremely easy for 5 minutes, then do easy/comfortable for the majority of the run (about 15 or 20 minutes on my schedule), and then finish up with another 5 minutes of extremely easy running. In this plan, easy is just another word for slow. So slow that I’ve had to walk a few times to keep in the right heart rate zone. Which I find incredibly annoying. But on the other hand, I really enjoy the middle chunk of these runs which is just a relaxing easy/comfortable paced run. Another thing I should mention is that I’ve been doing the foundation runs using a hill program on the treadmill, because when I go back outside there will be hills. This only make me have to go slower, and I’d probably enjoy the runs more if I didn’t do it. But future Amy will thank me for not completely losing all ability to run up hills. Do you use the hill function on the treadmill? How do you deal with excruciatingly slow running? Have you ever run through the city to catch a train, and how’d it work out for your legs? I’ve had my treadmill for a year and have yet to use the “hill” function. However, I think I am going to give it a try soon! Props for running hills on the treadmill – I just can’t bring myself to do it haha. And I love the knitting project! I have a hard time with hills on the treadmill, because there’s usually not a downhill setting, so I get tired out really easily. I like the idea of training less and “wanting more.” That would probably help avoid burnout! Hi, Amy! You won a prize in my L.A. Marathon contest (www.mustlovejogs.com) – email me at mustlovejogs[at]gmail[dot]com and let me know what address to mail it to – woo hoo! Also, I do run hills on the treadmill and I hate it! But like you said, future you will thank you. I also think it helps prevent injuries – or at least that’s what I tell myself! Woo! Thanks, Jason! I feel a little bad that my winning guess was that Ryan would drop out…but not super surprised! I’ll email you my info, and thanks again!